The Town of Akron is the Statutory Town that is the county seat and the most populous municipality of Washington County, Colorado, United States. The town population was 1702 at the 2010 United States Census. 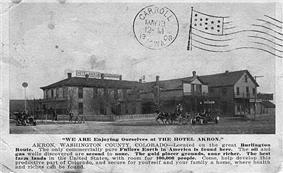 Akron began as a frontier town, and was named for Akron, Ohio. The town was incorporated in 1887. Akron is located at (40.161530, -103.211850), at the intersection of U.S. Highway 34 and State Highway 63. There were 734 households out of which 29.3% had children under the age of 18 living with them, 50.8% were married couples living together, 9.4% had a female householder with no husband present, and 37.7% were non-families. 33.8% of all households were made up of individuals and 16.8% had someone living alone who was 65 years of age or older. The average household size was 2.28 and the average family size was 2.94. In the town the population was spread out with 26.2% under the age of 18, 6.3% from 18 to 24, 23.4% from 25 to 44, 21.0% from 45 to 64, and 23.1% who were 65 years of age or older. The median age was 40 years. For every 100 females there were 97.3 males. For every 100 females age 18 and over, there were 89.8 males. Akron experiences a semi-arid climate (Köppen BSk) with cold, dry winters and hot, wetter summers. ^ "Shelby County Schools". ePodunk. Retrieved 2012-03-07. ^ "Climatography of the United States NO.81" (PDF). ^ "Monthly Averages for Akron, CO".